Urgent care is also called immediate care for obvious reasons. FastMed Urgent Care locations are in the community, open every day, all year long, no appointment necessary. Our medical clinics operate on extended hours, making it easier to see a doctor or medical professional. 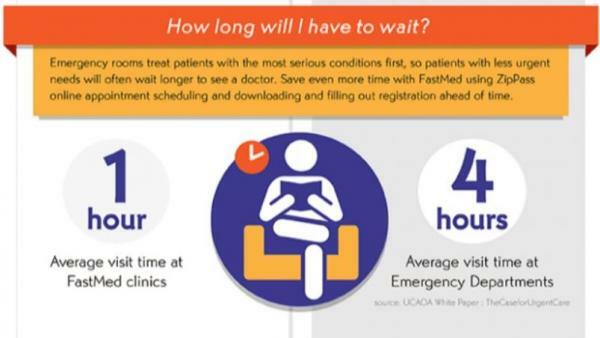 FastMed Urgent Care is committed to fast, reliable express urgent care, even without managing appointment schedules. It our goal to get you in and out within an hour, depending on the circumstances of your visit. That’s how we do express urgent care at FastMed. Sometimes you have to make a quick decision about where to go for urgent healthcare – FastMed or an emergency room (ER). If you think you have a life-threatening injury or conditions, dial 9-1-1 and go to the ER immediately. You can use this tool to see which symptoms indicate a hospital visit, but remember it is not a diagnostic tool nor is it an alternative to or to diagnosis or advice from a medical professional. When in doubt, be safe and head for the hospital. We do laboratory testing right on site. We don’t pay to ship it off to another location and you don’t have to come back a second time to get the results. We take and read digital X-rays at each express urgent care location. Easy to store, easy to share with a referral – no extra trip for you just to get an X-ray. FastMed is committed to delivering express urgent care, focusing on quality of care as our highest priority.